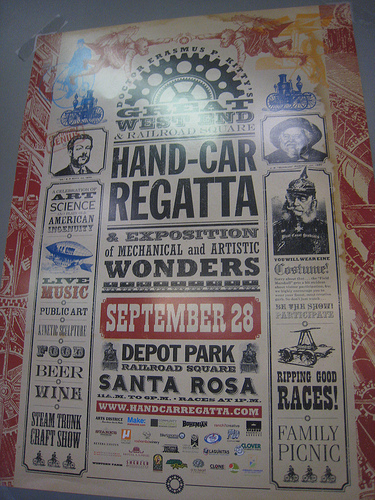 The Great Handcar Regatta - SUNDAY!!! This Sunday, September 28th, a grand event is to be held in Santa Rosa, California. It's called The Great West End & Railroad Square Handcar Regatta & Exposition of Mechanical & Artistic Wonders. It's free to get in, and perfect for all ages. Info on our favorite stuff can be found here. You can easily navigate to the main part of the site, as well as specific info and directions from there. The gang I've come to consider family, who built the Steampunk Treehouse last year, created a 10 foot diameter hamster wheel for humans called The Lumbering Contraption (pictured above). 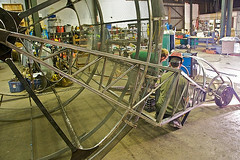 It is set to compete in the handcar races on the railroad tracks at the event.